Sustainable Choices 2040, approved in December 2014, is the long range transportation plan that guides the evolution of the transportation system in the Champaign-Urbana urbanized area over the next 25 years. The plan strives to use the existing infrastructure to optimize mobility while promoting a multi-modal transportation network that encourages environmental sensitivity, accessibility, and economic development to enhance quality of life for all users. 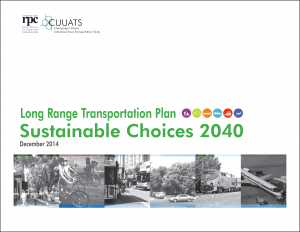 View the final LRTP: Sustainable Choices 2040 document. The Champaign-Urbana Urbanized Area Transportation Study (CUUATS) updates the long range transportation plan (LRTP) every five years as mandated by the Federal Highway Administration in order for communities in the urbanized area to receive federal and state funding for transportation projects. This website serves as the home of the current LRTP document, and an archive of the LRTP: Sustainable Choices 2040 planning process that took place between 2012 and 2014. Email Ashlee McLaughlin, CUUATS Transportation Planner, at amclaughlin@ccrpc.org with questions or comments about the current LRTP or any of the contents of this website. Your input will continue to support us as we collect data and plan for the next LRTP update, which will take place between 2017 and 2019.